The Coptic Orthodox Church UK: Press Release: His Royal Highness The Prince of Wales visits The Coptic Orthodox Church Centre UK accompanied by His Royal Highness Prince Ghazi bin Muhammad of Jordan. 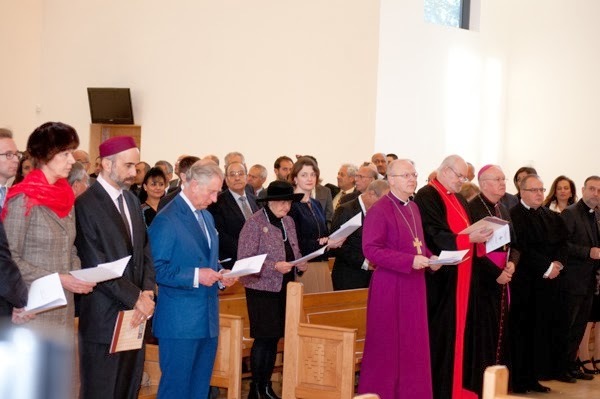 Press Release: His Royal Highness The Prince of Wales visits The Coptic Orthodox Church Centre UK accompanied by His Royal Highness Prince Ghazi bin Muhammad of Jordan. 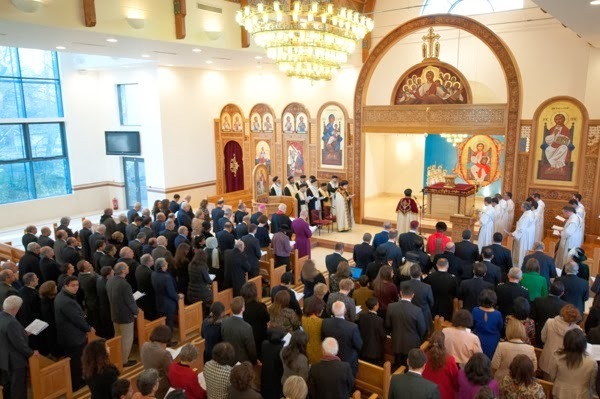 The visit began with a traditional prayer service, followed by a showcase of the vast number of ministries and strands of services operating under the umbrella of the Coptic Orthodox Church in the United Kingdom including, among others, benevolent work, relief and development, advocacy, youth ministry and inter-religious and ecumenical relations. Following this, Bishop Angaelos presented two Coptic icons to Their Royal Highnesses, with an icon of Saint George gifted to The Duke and Duchess of Cambridge and His Royal Highness Prince George. During the course of the visit there was a private meeting held to discuss the current situation in Egypt and the Middle East and contributions that could be made to offer viable solutions for those affected in the region. This was followed by afternoon tea in Shephalbury Manor during which the Prince of Wales unveiled a commemorative plaque marking the visit, and signed the official guestbook. 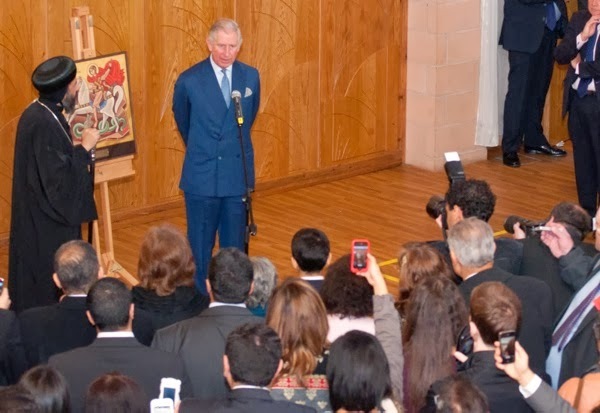 "I am thankful for the visit of His Royal Highness The Prince of Wales to our Coptic Orthodox community here today, as it celebrates its presence in, and contribution to the United Kingdom, and sheds light on the increasing struggles facing Christians in the Middle East, the birthplace of Christianity. I am also appreciative of Prince Ghazi’s visit. As we approach the Feast of the Nativity, we are also reminded that this is a time in which many in the Middle East are affected by war and conflict, but as His Royal Highness highlighted today, Christians in the region remain resilient and faithful despite the challenges faced. With respect to Egypt, despite numerous attacks on their loyalty, Christians continue to be an integral and stabilising component of their society and have responded graciously to continued and escalating attacks, proving their commitment to a legitimate process of change. Believing that there is always hope, we pray for this spirit of collaboration and cooperation to be a springboard to greater advocacy for, and representation of, those who do not have opportunities for their own voices to be heard, but rather rely on us to amplify those voices." "Today I just wanted to join you to express my deepest concern and deepest sympathies and solidarity with all of you because I know you will have relations in Egypt and all I can tell you is that we pray with all our heart for their safety and for their continuation in a country where Coptic Christians have played such a vital part for hundreds and hundreds of years. They often build bridges between different groups and religions, and if I may say so I have been so full of admiration and respect for the way in which the Coptic Christians have been so full of forbearance and longsuffering that is quite remarkable, and the lack of retaliation even more remarkable. And for that, I think we owe all of you a remarkable debt, not only gratitude, but respect for living out your Christian Faith in the way that you do." Overall, the visit highlighted Coptic Orthodox presence in the United Kingdom, and the challenges facing Christians in the Middle East, showcasing their immense contribution to their communities as active citizens of their respective countries. The service was attended by The Lord Lieutenant of Hertfordshire, The Countess of Verulam, The Lord Bishop of London, The Right Reverent and Right Honourable Richard Chartres, The Bishop of St Albans, members of the House of Lords and the House of Commons, heads and representatives of numerous Christian Churches and denominations, as well as inter-religious guests, and representatives of governmental and non-governmental organisations. Following the visit is a reception at Clarence House where Their Royal Highnesses will be joined by guests representing Christians from Egypt, including Bishop Angaelos, as well as from Syria, Iraq, Jordan, Lebanon, Turkey, Palestine and Israel.